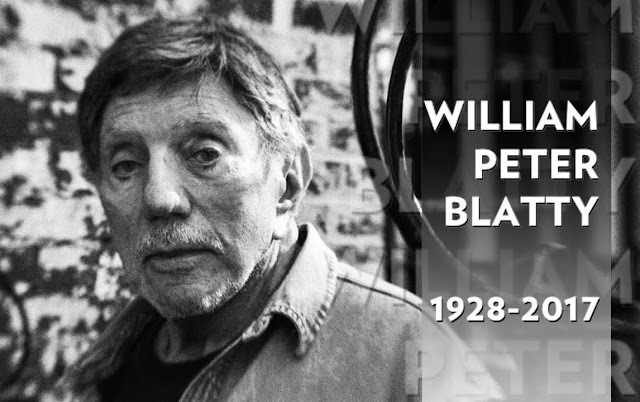 William Peter Blatty died on January 12, 2017. He was born in 1928 and had just turned 89. The Pantheon shrinks, and we didn’t just lose the statue of a god. We lost the Colossus of Rhodes. Blatty is best known for writing THE EXORCIST and a string of less successful books and films. That’s the story, anyway. If you hew to that definition, you will miss out on one of the funniest, most exciting, most poetic, and most optimistic authors of that notoriously bleak period, the second half of the 20th century. In all of his major works, he is an advocate for the best in man. Relentlessly so. Literature, an art form that so often strikes me as a bleak and joyless carnival highlighting the most pedestrian of man’s shortcomings, is like a pirate ship assailed by Blatty. The optimism of William Peter Blatty is not mindless. It is well aware of every rotten thing we can do. It has observational wit that is so sharp and unforgiving, it makes IT’S ALWAYS SUNNY IN PHILADELPHIA sound like FRIENDS. I had known THE EXORCIST to be That Really Scary Movie for People who Believe That Sort of Thing, but then, when I was 14 and knew everything, I had the chance to see THE NINTH CONFIGURATION on the big screen. The legend had it that you could only get prints from Blatty. The prints were always changing. And this was pretty much true. I am far from a religious man. Ultimately, I don’t think that matters. Blatty’s theology is a theology of action. It is a theology that simply makes the world a better place, and does so with a sense of hope and possibility and confidence that happens all too rarely. It has beauty and poetry... and maybesometimeskinda results that are worth it. Often, they are not. But that problem is not with you. If anything, it’s all the more reason why the fight is worth it. The influence of Blatty in my life has caused me a lot of loss and pain. It has led to, yes, legions of armored and cynical people clucking their tongues at me, thinking me a sap for helping so-and-so once more. Yet I don’t like the other side of that choice. The alternative of a world devoid of help -- or of help limited to the moral-equivalent-of-an-extended-pinky sensibility -- is not a world I want to help build. So, yes, I guess there are lots of moments of Father Karras and “take me, take me.” The joy of Blatty and his influence is in the long game. It’s played with wit and awareness and irony and, most importantly, love. Rather than be weak, Blatty requires you to be the never-quite-ex-boxer that we see in Damien Karras. The loss created by his death is balanced by the joy created in those few moments when the extraordinary and heroic kindness he advocated yields extraordinary results.